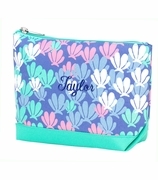 QUANTITY REMAINING TEACHER INSPIRES (3), TEACHER + (3), TEACHER INFLUENCE (1)Personalized teacher accessory pouch. Cute teacher carry all for cosmetics, bath and beauty items, miscellaneous tech cords, pens, pencils, and other stationery items. Keep them separate and easily accessible in this delightful case. It is silk-screened with teacher sentiments in your choice of three fun text messages. "The influence of a good teacher can never be erased", "Teacher, one who inspires, guides and motivates", and "Don"t make me get out my red pen". Durable canvas material with zipper closure. 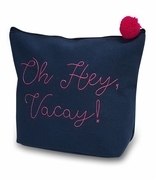 Show a special teacher how much you care with one of these whimsical pouches. Give as a teacher appreciation gift, end of school season present or thank you gift for a teacher starting her career. 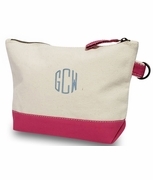 We offer a coordinating monogrammed tote bag search item MP-4035006 with name or initials. Monogram teacher accessory pouch measures 9"W x 6.5"H.